Grey is not really a distinct colour trait but rather the combination of all of the non-expressed states of the other colours. This is discussed in "Is Standard Grey a separate colour?" Other rare colour traits include Sullivan Beige , Rzewski Beige , Wellman Beige , French "Blue" , Busse Charcoal [1961-2], Lester Black , Treadwell Black , etc. Most no longer exist. A historical listing has been compiled by the MCBA . A more complete listing may be found in Alice Kline's Chinchilla Genetics book. The naming system for Chin colours is becoming rather chaotic, especially among pet Chin breeders and owners. Too often, new names are invented either from the lack of knowledge or for marketing purposes. This merely serves to confuse the Chin community. To some extent we are bound by tradition: For instance, ranchers have always used the term "White Mosaic" to refer to a white Chin with some degree of grey infiltration of the fur [and not the other way round] . However, this leaves such colour mixtures as White and Beige, White and Black Velvet, and White and Ebony in limbo. Terms such as pie-bald, mottled, variegated, etc are being bandied about to address this situation. Currently, the best standard for Chin colour nomenclature is the MCBA. However, one should note that even the MCBA uses the terms "Ebony" and "Charcoal" interchangeably when in fact Charcoals and Ebonies are two distinct colour traits. In conclusion, while seemingly awkward, the useage of the terms "hetero" and "homo" for various colour conditions is the most accurate. Each of these traits is assumed to be polygenetic [or multi-alleleic] because they don't seem to occur in strict on-off patterns. Rather, there is some degree of variation within each. We can see this with Wilson Whites wherein White Mosaics can also occur. With Black Velvets, there is some variation in the extent the solid black extends down the sides. Beige is well known to be highly variable in shading. Finally, the Ebony trait will demonstrate progressive darkening in the heterozygous state through successive generations of hetero Ebony to hetero Ebony mating. However, the number of genes involved with each particular colour is not known at this time but dozens to hundreds [or even thousands] may not be too unreasonable. Afterall, most mammalian DNA contain between 60,000 to 150,000 active genes [depending upon who is counting them]. These colour traits are also assumed to occupy mostly different loci [locations on the chromosomes] because the interaction between the various colours is not a simple negation but rather some degree of co-existence. Blending of traits may indicate overlap of loci but this will depend upon specific colour combinations. The genes underlying a specific colour trait always exist in linked pairs as part of the double helix structure of the DNA strands that comprise the chromosomes. Any given gene will have one or [usually] more variations called alleles. If the alleles in a given gene pair are identical, then the situation is referred to as "homozygous". If they differ, then the state is called "heterozygous". Similarly, we refer to specific Chin colours are being either homozygous or heterozygous to reflect whether the colour exists on both DNA strands or not. This is an over-simplication because we cannot be sure that all of the genes on a particular DNA strand responsible for a particular colour are the same or not. But for practical purposes, the labels will suffice. For practical purposes, we use simple letter codes to represent the entire set of alleles underlying a specific colour mainly because subsets have not been isolated and independently propagated. For instance, red eyes are linked to the Beige trait. At one time, hetero Beiges would have dark red eyes while homo Beiges would have bright red eyes. However, a decoupling appears to be occurring as we can find bright red eyes in some hetero Beiges and Brown Velvets. Nevertheless, we are not at the point of propagating the red eye colour independently of the Beige trait. However, in modern contexts, these MCBA codes can be explicitly rejected for several reasons. Some of the letter codes are actually based upon the names of the proteins that are presumed to be involved in laboratory mice colours and bear no relation to actual phenotype names, especially for Chins. As well, there is an inherent contradiction between the MCBA codes for Ebony and Charcoal: for recessive traits, uppercase means the trait is not active while lowercase refers to the active state. Finally, many automatically think of "Pink White" when they run across "pw" that MCBA uses to represent Tower Beige. For newcomers to Chin genetics as well as hobby breeders, these inconsistent and esoteric MCBA codes are confusing and pose a barrier to comprehension and accurate breeding. It is our position that, reflecting democratic trends in society, Chin genetics should be readily accessible to the average Chin owner and no longer restricted to breeding elites [ie., fur ranchers]. Most find the second Punnett Square easier to understand and remember. As you can see, the letter g acts as a very convenient placeholder to represent non-expressed colours. The effects of the various color traits are complex. Various models such as spotting genes, tipping genes, pigmentation genes, dilution genes, and distribution genes were commonly used several years ago but little mention of them has occurred the past couple years. The accuracy of these models remain to be determined. As well, some of the colour traits don't fit the categories perfectly. Nevertheless, some obvious patterns are readily discernable. The Beige trait changes the pigmentation of the fur shaft from black to beige. In the homozygous state, it also colours the "bar", the light spot 2/3-3/4 of the way along the fur shaft. The Wilson White trait also changes the pigmentation of a fur shaft from black to white. Yet, it too has a distinctive pattern: grey ears and base of the tail. The Wilson White trait also appears to have a number of on-off alleles which are responsible of its sometimes incomplete dominance over "grey": hence the existence of White Mosaics [aka, Silvers, Pandas, etc]. Call this a "Dilution effect", if you like. The same pattern occurs in a Pink White that is homozygous for Beige [and to a much lesser extent, heterozygous for Beige]. Furthermore, this incomplete dominance is cumulative in that White Mosaics, when mated to Standard Greys, have a strong tendency to begat White Mosaics when become progressively "greyer" with successive generations. Finally, there appears to be Wilson White alleles which cause this progressive "greying" to be expressed either as patches or more uniformly. The Ebony trait is a source of confusion for many. It changes the fur pigmentation, including the bar, from black to an extremely dark brown. It also has distributive properties in that it has the potential to colour the belly and ears. In many ways, it is analogous to the Beige trait. The Ebony trait is weakly dominant but is usually referred to as a "Cumulative Recessive". This reflects the fact that if hetero Ebonies are mated together, hetero Ebony offspring will become progressively darker with successive generations. Again, it is speculated that, like with White Mosaics, a series of on-off alleles are involved. The "Recessive" portion of the "Cumulative Recessive" label is not accurate because, unlike in a true recessive, the Ebony colouration will still be expressed in the heterozygous state. The 3 true Recessive colours, Charcoal, Sapphire and Violet, appear to change the pigmentation of the fur shafts. I don't know if the bar on the fur shafts are affected or not. 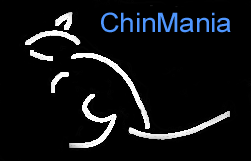 © 1999-2007 ChinMania & AniMania The concept, design, and all content of ChinMania the Chin Colour Calculator the Chin Colour Crosses the Chin Owners Directory as well as the terms "ChinMania", "Chinmania", "chinmania", "Chin Mania", "Chin mania", "chin mania", "ChinManiac", "Chinmaniac", "chinmaniac", "Chin Maniac", "Chin maniac", "chin maniac", and any derivations thereof, is copyrighted by ChinMania and AniMania ( © 1999-2007 ChinMania & AniMania ) and may not be used without the express written permission of ChinMania and AniMania.